I got this FABULOUS Elton John postcard months ago on a swap-bot swap for LGBT people. I am so taken with this image - Elton (he wasn't Sir Elton yet, then) in his closet, surrounded by shoes, with a little stuffed replica (of him, most likely?) on his shoulder, beatific expression on his face, complete with hat. It's one of my favorite postcards ever. Weird coincidence: when I pulled this postcard out of my mailbox, an Elton John song was playing on the radio in the UPS store that holds my mailbox. I think it was "Tiny Dancer." My excellent swap partner DID put a return address on his postcard, so I finally got around to sending him a thank-you postcard. 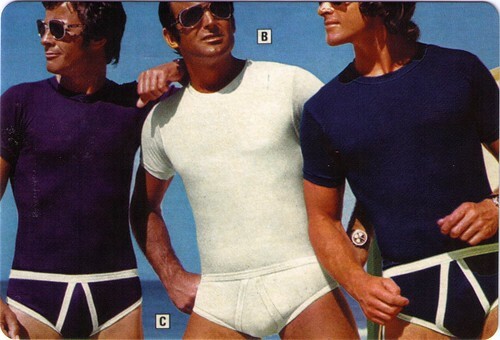 I don't have anything that is on par with Elton John, but I thought one of the fine underwear postcards from Catalog Man: Mail-order Fashion Hunks from Chronicle Books would be about the best I could do in these circumstances. Great postcards, both of them. The shoes put a smile on my face. The thing that jumped out at me on the second one is that all three of these guys are wearing watches. I was in a meeting the other day and was the only person wearing a watch. I love the postcards -- hilarious!! Especially love that Elton John card! I was madly in love with him around that time; and was devastated when he wed Renata c.1980. Could *not* understand why he hadn't sought *me* out! Recently found your blog, and am lovin' it - thanks!